Sharing HOME is a constructed and diverse environment: three artistic disciplines coexisting, behaving as living identities and creating a unique ecosystem through each performance. 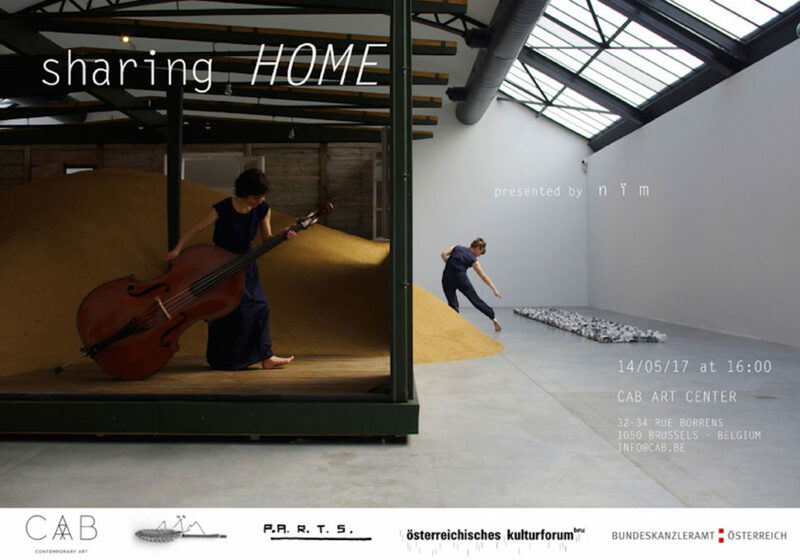 After the creation process in Cuba and Austria, on May 14th Sharing HOME will build a temporal home at CAB, opening a space for a fictional, autonomous and temporary community, and to reflect on how polyrhythms and polymeters can create a sense of togetherness. First Production in Cuba (2016): Gabriela Reyna Visual Art, Louis Alberto Marino Composition. Nïm is a company based in Austria, founded in 2016, focusing on the interdisciplinary work between dancers and musicians. Sharing HOME – in cooperation with BKA and ÖKF Brussels. Thanks to P.A.R.T.S., Karin Zimmer, Anna Lischka, Marina Chrystoph and Evelyn Simons.